February has arrived! Anyone else really confused as to why the Seahawks decided to pass the ball on 2nd and goal from the 1 yard line? Other than Cris Collinsworth, who was apparently even more baffled by the call than I was. 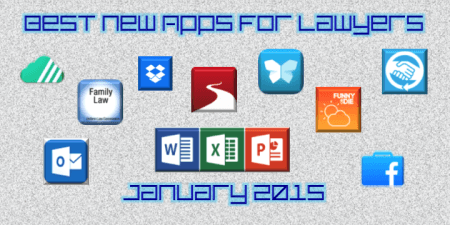 Anyway, another month has passed, and a whole new slate of apps have been released. And when I say a whole new slate, I mean a WHOLE new slate. As in, so many that I had to leave a bunch of good apps off the list, like the new apps FullContact, Timeline, and Bluenote, which I nevertheless highly recommend checking out. Facebook at Work by Facebook, Inc., free (iOS, Android). Well, it’s not necessarily the best start for quite an impressive list of new apps, but there’s no denying that when Facebook releases a whole new system for enterprise social networking, it needs to be discussed. Facebook at Work wants to help you, well, Facebook at Work. If your company utilizes an enterprise communication system (meaning you’re able to send instant messages to your co-workers), then Facebook hopes you’ll consider trying this new offering. Designed with a news feed for staying up-to-date with the goings-on of your company, the best feature is probably the groups settings, allowing for collaboration between any number of your co-workers. I personally wonder whether Facebook at Work or Google Hangouts will win this battle. Any thoughts? Comment below! Starlike by AOL, Inc., free (iOS, Android). Most people may not think that being able to follow feeds from multiple social media sites is all that important for an attorney. For those people, I would strongly suggest reading, well, anything about marketing a small business in today’s world (such as my post on social media managers). For those who already understand, or just want an easier way to review personal social media feeds, there’s Starlike. Combining your feeds on Facebook, Twitter, and LinkedIn, you’ll never miss an important update. You can sort and filter through all of your connections, and interact directly with the post. New posts are updated as soon as you open the app, and even save certain items for later. Outlook by Microsoft Corp., free. Much like the release of iOS apps for Microsoft Word, Excel and PowerPoint last year, I have to wonder if the release of Outlook for iOS devices is too little, too late. After all, most lawyers who use iOS have probably figured out a way to sync their email and calendars onto their iPhones and iPads, and once ingrained, it’s difficult to get us to change our patterns. Nevertheless, Outlook remains the flagship program for enterprise email and calendar systems, so there is inevitably going to be a significant number of people interested in this app. It isn’t fully functional like the desktop version, but appears to be a pretty decent initial effort. Moreover, like all apps, future updates will likely expand the apps available functions, bringing it closer and closer to the desktop version. Negotiation 360º by Michael Wheeler, $2.99. Having recently introduced a local attorney to the potential benefits of negotiation apps (via the free version of Picture it Settled), this app caught my eye. Created by Harvard Business School professor Michael Wheeler, Negotiation 360 seeks to make you a better negotiator. It does this by not only keeping a record of your negotiations, but by helping you improve your negotiating skills. By tracking your negotiations, and providing evaluations of your performances, Negotiation 360 creates a personal profile of your strengths and problem-solving traits. By analyzing your self-evaluations, the app actually highlights areas where you can improve. Importantly, unlike other negotiation apps, Negotiation 360 takes that information and helps you prepare for upcoming negotiations. Evernote Scannable by Evernote, free. I am a die-hard user of Evernote. For keeping track of by blog ideas, interesting articles, and sorting important information, I use it frequently. I have loved all of their expansions to date (particularly the joint venture with LinkedIn for business cards), and their most recent expansion is quite handy. I’ve used a lot of document scanning apps, and I have to say that none of them have turned out to be a truly useful solution. While Scannable isn’t fixing the entire problem, it’s the most capable solution I’ve come across. Scannable will automatically frame, sharpen, and save any document you scan with your phone’s camera. The document can then be saved to any location accessible by Evernote, including several different cloud storage providers. Oh, and those business cards, they’re automatically connected to LinkedIn. ULC: Family Law by Linsay Associates, LLC, $9.99. Family Law is a new app for family law attorneys, created to keep all the important uniform family law statutes right on your iPad. A cross-venture between the developer and the Uniform Law Commission, the app has the full text of many of the uniform family law statutes across the country. With regular updates, practitioners will always have the most recent version of these crucial laws right on your iPad. Fully searchable, you can also directly compare the uniform acts with those adopted in individual states, complete with up-to-date citations. Funny or Die Weather by Funny or Die, free. Let’s face it – even though weather apps are pretty much basic and essential on a smartphone, making them interesting has been… odd. The Weather Channel’s app, which seems to me to suffer under the crushing weight of needing to be a profitable weather reporting company, is pretty but cluttered with ads. Others simply aren’t intuitive. Most importantly, NONE of them are entertaining. Until now. Open up your weather in Funny or Die Weather, and not only will you get a surprisingly accurate weather report (I had my doubts), but an entertaining joke as well. “Weather fact: the humidity of water is very high.” Not anywhere near the best joke I’ve seen on the app, but I don’t want to ruin it for you! Microsoft Word/Excel/PowerPoint for Android by Microsoft Corp., free. Although they are not full-featured apps (really, what is? ), the essential functionality is there for all elements of each program. Create and view Word documents, including images and charts, just as they appear on your desktop screen. Use all of the formulas that you’ve become accustomed to on Excel, and sort information in full-featured pivot tables. Create, modify, and present slideshows directly from the PowerPoint app. Unclouded by Christian Göllner, free. By now, most lawyers have come around to the utility and security of storing data in the cloud. Whether it’s a managed document system like NetDocuments or personal or business storage with Dropbox, Box, iCloud, etc., we are all storing an increasingly large amount of data in the cloud. As with anything, too much clutter can make even the best system unusable. That’s where Unclouded comes in. Unclouded analyzes your cloud files and provides you detailed information about their use. Find out what files contain the most information and which files are the most recent. Locate duplicate files and manage your individual folders. By locating and deleting duplicates, and keeping informed about what files you may not be using enough to justify storing them in the cloud, you’ll never waste your cloud storage space again! Tutanota by Tutao GmbH, free. These days, everyone is concerned about privacy and security. As attorneys, we should be even more concerned. Tutanota directly addresses those concerns – it’s an open source email system that allows end-to-end encryption. For those who aren’t up with the lingo – it’s the most secure type of email you can have. Just to convince you, the entire app is open-source, allowing anyone to confirm that the code contains the proper encryption. Whether or not the recipient has the Tutanota app, you’re able to send completely encrypted emails, including attachments, to any email address. If they don’t have Tutanota, no problem – a password will decrypt the message. Fully compatible with your existing contacts information, and with 1GB of free storage space, Tutanota is an ideal secure email client. Dropbox by Dropbox, Inc., free. Ok, I feel a little bad about this one, but until I saw the press release about this app, I had always assumed it was already available. I’ve been using Dropbox on my iOS devices for as long as I’ve been using Dropbox (a while). I’m not sure who was behind the delay, Dropbox or Microsoft, but this one is WAY overdue. So… Windows Phone users can now use Dropbox. Welcome to this decade. Its always awesome using Microsoft Outlook.Some of its features are difficult to understand but overall its amazing.